Dentures are an excellent option for patients looking to replace missing or damaged teeth, allowing them to restore their smile back to a natural look. At Bridge Creek Dental, we are committed to providing quality oral care options for all the people who visit our office. If you are in need of multiple teeth replacement, then our dentists are happy to help you determine if dentures are right for you. Carefully constructed replacement teeth, dentures are generally made of acrylic resin with metal infused to support the acrylic resin. Our dentists work with patients to determine the size and color of the dentures, so they fit comfortably in the mouth and look natural. There are two basic variants of dentures — partial and full. Within these variants, there are a few different types of dentures. When some of the person’s natural teeth are still healthy but they have multiple missing teeth, partial dentures can be a good way to replace those missing teeth. 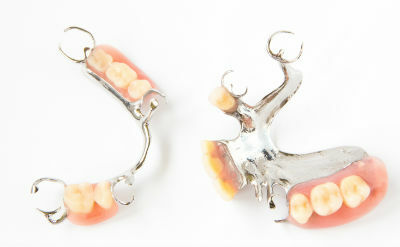 The partial dentures are constructed to blend in with the person’s natural teeth, set on a metal frame. Partial dentures are removable and should be removed nightly for cleaning. Jawbone density loss is likely in areas where missing teeth are not replaced but only covered with partial dentures. Choosing partial dentures is one of the most affordable ways to replace multiple missing or damaged teeth. Gums shrink over time where teeth are missing so the partial dentures will need to be refitted to the changed shape. Irritation can occur in areas where the partial dentures are resting on the gums. Bacteria can become trapped in the area between where the partial dentures rest against gums and teeth. The trapped bacteria can induce cavities to form. One of the most common types of dentures, traditional dentures are full dentures which replace all of a person’s teeth. These dentures are removable and need to have an adhesive applied to them to keep the teeth in place while in the person’s mouth. Traditional dentures need to be removed every night to be cleaned. Without teeth to support the gums, shrinkage will occur over time and cause the dentures to fit poorly. Our dentists can help you determine what can be done if you experience gum shrinkage while wearing dentures. Most affordable way to replace a full set of missing or damaged teeth. Jawbone loss will occur while wearing traditional dentures, as there are no teeth supporting the bone density retention. For secure, natural-looking replacement teeth, implanted dentures are the best option. 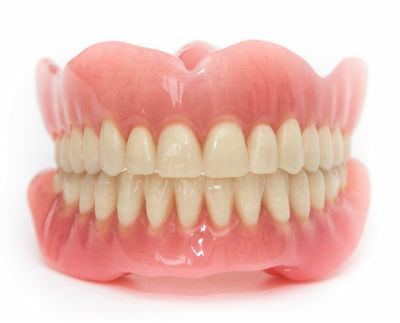 This style of full dentures do not need to be taken out at night. In fact, thanks to titanium posts implanted in the jaw bone, implanted dentures are held in place. These dentures do not require you to change your diet as you can eat as you normally do and not worry that they will become dislodged. Implanted dentures cannot be removed without the assistance of a dentist. One of the most expensive options available when replacing all your teeth. Stronger materials are used to make implanted dentures as they are expected to take more wear and tear as they are fixed in place. Jawbone density is supported by implanted posts, helping stave off the sunken look which can occur when all teeth are missing. A less commonly chosen option when it comes to full dentures is implant-supported dentures. 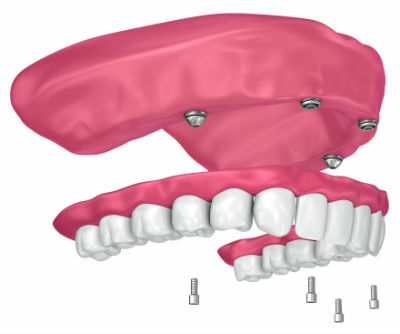 These dentures combine implants with removable dentures, allowing the wearer to enjoy the stability of implanted dentures but able to remove the dentures from the bar they rest on. These dentures tend to be made of the same acrylic resin materials of traditional dentures and are less tough than implanted dentures. Generally, the cost of these dentures ranges between traditional dentures and implanted dentures. Bone density is supported by the implants. Implant-supported dentures can be removed for easy cleaning between the dentures and your gums. For those in the position of needing to consider receiving dentures, there are several ways they can benefit from choosing dentures, no matter the style they choose. 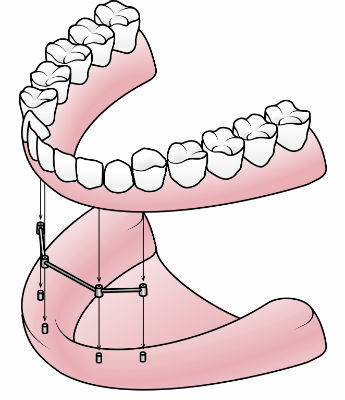 Dentures give more structure to the face and prevent a sunken-in effect. Smiles can appear healthy and natural again. Easier to eat while wearing dentures, rather than chewing with gums or damaged teeth. Boosts self-esteem to have a full set of teet. Dentures need daily care in order to keep them clean and eliminate bacteria from getting into your mouth. Like teeth, the better you take care of your dentures, the better they will look and feel. Brush your dentures every day with a soft toothbrush to get rid of plaque and tartar buildup. Keep the inside of your mouth, such as the tongue and gums, clean by using a soft-bristled brush every day. Use a mild denture cleanser instead of harsh and abrasive cleaners like toothpaste or mouthwash. Always clean your removable dentures over a soft surface, like a folded towel, to prevent them from breaking if you drop them. Store your removable dentures in a special cleaning solution to keep them moist and prevent them from losing their shape or cracking. Should you live in the Billings, Montana, area and need dentures, then Bridge Creek Dental is the dental office for you. Our dentists have years of expert dental experience and have helped countless people rediscover their smile through high-quality dentures. Also, if you have other cosmetic dental desires or other dental-related needs, our dentists also provide a wide variety of dental services outside of dentures. 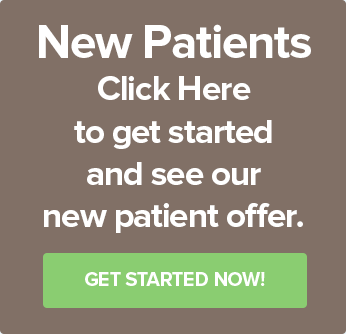 Contact Bridge Creek Dental at (406) 652-1600 for a consultation. We look forward to serving you!